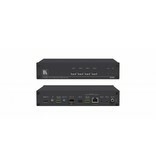 692 is a high−performance HDBaseT 2.0 fiber receiver for ultra−reach extension of 4K60Hz (4:2:0) HDMI, USB, Ethernet, RS−232, IR and stereo audio signals over either multi−mode or single−mode fiber optic. 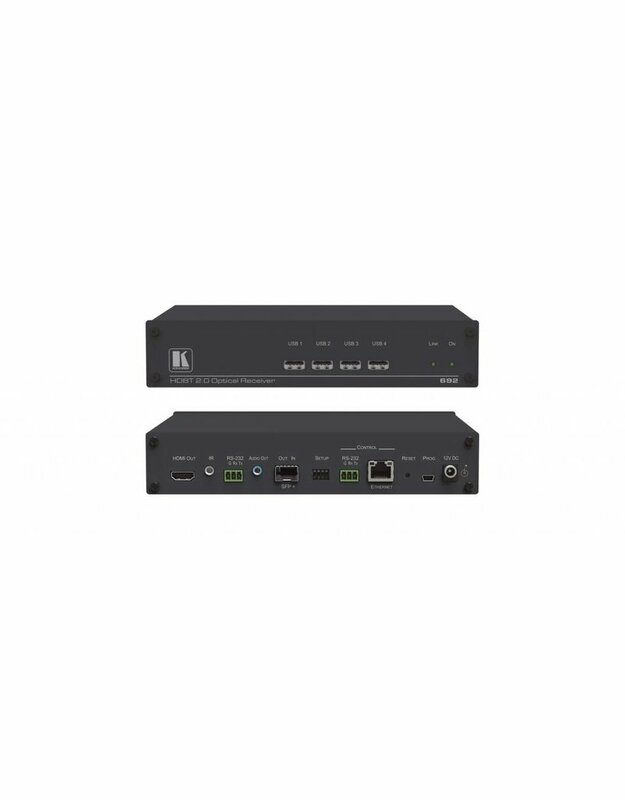 692 converts the HDBaseT 2.0 fiber optics signal received from an extended line transmitter, such as Kramer 691, back into 4K60Hz (4:2:0) HDMI, USB 2.0, Ethernet, RS−232, IR and stereo audio output signals. 692 extends video signals to up to 33km (20.5 miles) over single−mode fiber at up to 4K@60Hz (4:2:0) resolution. High Performance Standard Fiber Extender — HDBaseT 2.0 fiber receiver for providing ultra–reach signals over either multi–mode or single–mode optical fiber infrastructures, using Kramer pluggable OSP SFP+ units. 692 is a standard fiber extender that can be connected to any market–available HDBaseT–compliant extension product. Note: To ensure Kramer support and warranty of the 692 product, use only Kramer's certified hi–performance OSP SFP+ pluggable optical units. For optimum extension reach and performance, use Kramer's OSP SFP+ units and recommended Kramer cables. Non–Kramer cables may not reach these ranges. HDMI Signal Extension — HDMI 2.0 and HDCP 1.4 compliant. Supports deep color, x.v.Color™, lip sync, HDMI uncompressed audio channels, Dolby TrueHD, DTS–HD, 2K, 4K, and 3D. EDID and CEC signals are passed through from the source to the display. I–EDIDPro™ Kramer Intelligent EDID Processing™ — Intelligent EDID handling, processing and pass–through algorithm that ensures Plug and Play operation for HDMI source and display systems. USB Extension — USB 2.0 interface data flows in both directions, allowing extension of HID (Human Interface Devices) peripheral devices, such as a mouse or a keyboard. High–bandwidth USB peripheral devices, such as USB isochronous streaming cameras and audio devices, transfer data continuously and periodically. Delivery of their transferred data is not guaranteed by the USB standard and is subject to both USB and HDBaseT line bandwidth management limitations. When such devices are connected, check their functionality to ensure bandwidth limitations are not exceeded. 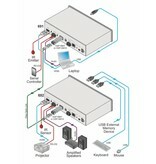 Ethernet Extension — Ethernet interface data flows in both directions allowing extension of up to 100Mbps Ethernet connectivity for LAN communication and device control. 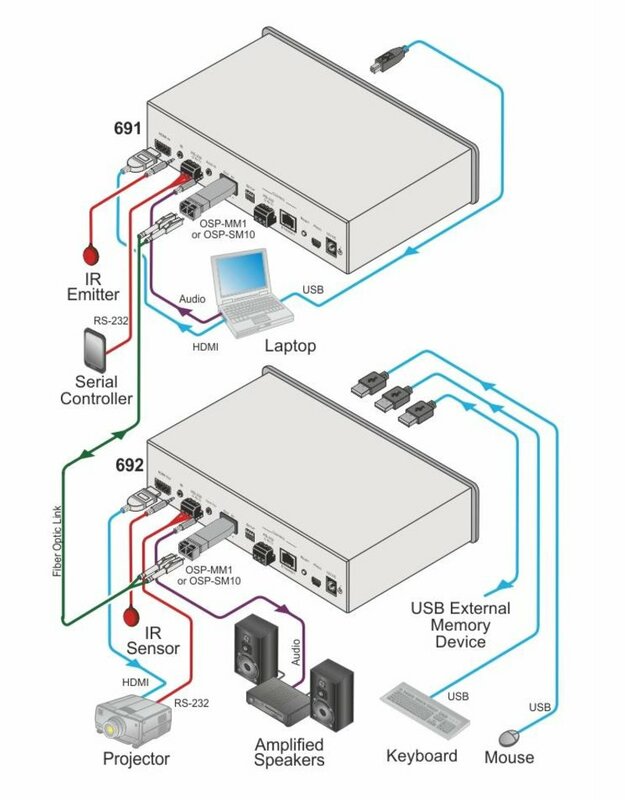 Bidirectional RS–232 Extension — Serial interface data flows in both directions allowing data transmission and device control. Bidirectional Infrared Extension — IR interface data flows in both directions allowing remote control of peripheral devices located at either end of the extended line. Audio De–embedding (Drop–and–Continue) — The transmitted digital audio signal is extracted from the AV signal (dropped), converted to an analog signal for transmission to stereo balanced analog audio output, in parallel to being transmitted (continued) to the HDMI AV output. 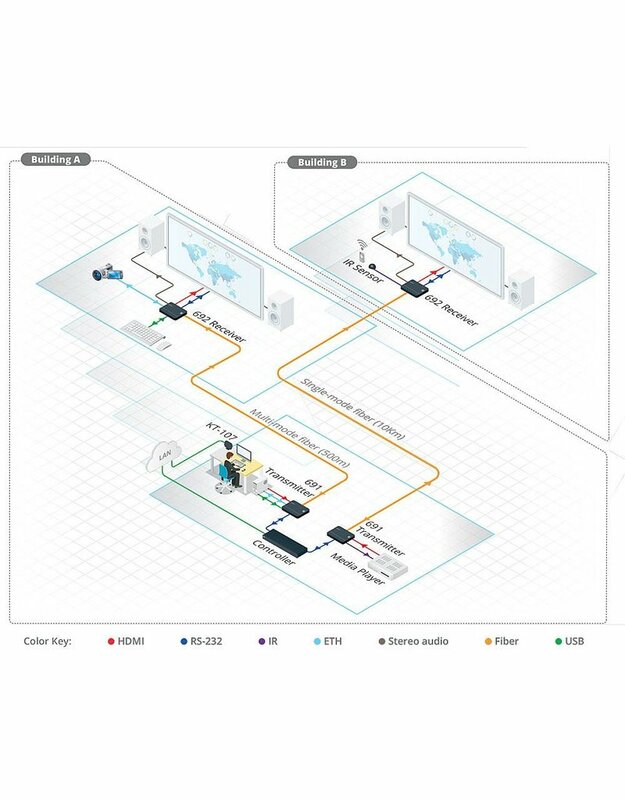 This enables high–quality audio playback by routing the audio to external speakers in parallel to routing the audio to the connected AV acceptor device’s local speakers (such as TVs with speakers). Cost–Effective Maintenance — Status LED indicators for the HDMI input and HDBT output link facilitate easy local troubleshooting. Remote device management via built–in web UI and RS–232 connection enable simple device maintenance. Local and remote firmware upgrade via mini–USB, RS–232 or Ethernet connection and the K–Upload tool ensure lasting, field–proven deployment. Easy Installation — Half 19” 1U rack mountable fan–less enclosure enables side–by–side mounting of 2 units in a 1U rack space.